I really can’t stand last minute surprises! I need a lot of time to plan out my meals, mainly because I am easily distracted, so it just takes me a long time to figure these sorts of things out. And that’s exactly why I love this challenge because it’s allowing me to think of something to make at the last minute now so I won’t have to…at the last minute! The idea for this very simple quick, last minute dish came from my husband and I use it often, and not just to take to an event of some kind. There have been many times we've had cold boiled shrimp for dinner! We love it and because we do, we keep several pounds of shrimp in our freezer at all times. I can’t stress how much I love the Good Cook 13" x 9" Nonstick Covered Cake Pan! It works so well for this shrimp! I was very surprised and I cannot wait to see what other uses I will come up with for it. Bring a large pot of water with 3 tablespoons of Slap Ya Mama Seafood Boil to a rolling boil. Add the shrimp and cook for about 3 minutes. Shrimp are wonderful because you will clearly see when they are fully cooked. They turn pink on the outside! If you look at the end of the shrimp, you will see it is pink/white throughout when fully cooked. Make the cocktail sauce (I stole this recipe from Willie!) while you are waiting for the shrimp to cook by mixing the remaining two teaspoons of Slap Ya Mama Seafood Boil with the ketchup and stir it with a spoon or a spatula like this one. If you have horseradish on hand, you can use it instead of the Seafood Boil, but I often find I don’t have it. Remove the shrimp to a strainer, rinse them to remove any debris, shake them off and put them into the 13" x 9" Nonstick Covered Cake Pan. Pour ice over the shrimp, as much as you can, while still being able to place the cake pan cover on the cake pan. The shrimp will cool during the drive to your event. 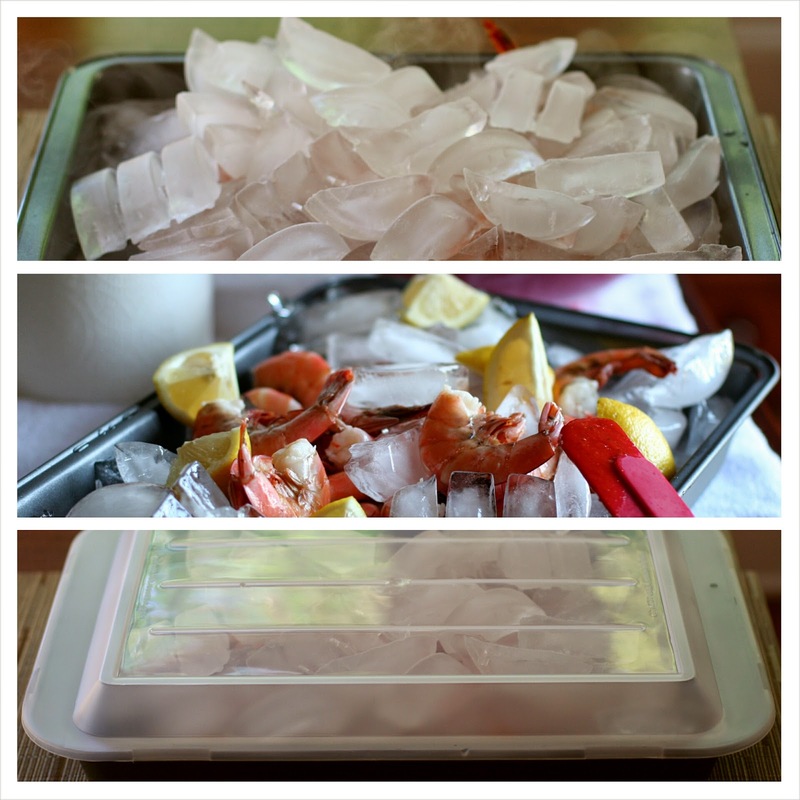 Drain the shrimp when you get to your destination and add more ice if it’s available. Top with the lemons, stick the bowl of cocktail sauce in the pan and you're everyone's best friend!